One of Reinhardt’s most esteemed leaders was laid to rest in a private service earlier this month. The Rev. Dr. Allen O. Jernigan passed away June 8, 2016. He was 93. The Rev. Dr. Allen O. Jernigan, who served Reinhardt as its president from July 1, 1973 to March 14, 1984, passed away June 8, 2016. He was 93. 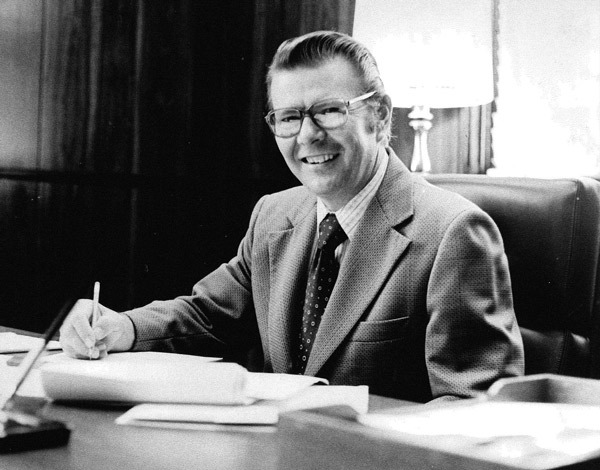 An ordained minister, Dr. Jernigan led Reinhardt as its president from July 1, 1973 to March 14, 1984. While he did not earn a degree from Reinhardt, he was bestowed Honorary Alumnus title in 1987. Dr. Jernigan is remembered as a laid back leader who always lent his support to those at the institution of higher education. JoEllen Wilson, former vice president for advancement, started her tenure at Reinhardt under the leadership of Dr. Jernigan. “I always felt Dr. Jernigan’s support at work every day,” she said. Wilson said Dr. Jernigan and his wife, Linnie Lou, came to Reinhardt after spending several years in China as missionaries. In the mid-1970s, he was appointed by the North Georgia United Methodist Conference as Reinhardt’s new president. Soon after, he brought in Dr. Floyd Falany, who had taken a two-year sabbatical from the University of Georgia to serve as Reinhardt’s Academic Dean and to help with curriculum. While Dr. Falany brought the first earned doctorate to Reinhardt in the 1970s, he and Dr. Jernigan pushed for continuing education. Dr. Jernigan went back to school and earned his doctorate from Vanderbilt University, Falany said, adding together they encouraged others to go back to school. During his tenure as president, Dr. and Mrs. Jernigan lived in the Church parsonage, but it also was during his time as Reinhardt’s leader that the President’s Home was built. Dr. Jernigan was the first president to call it home. Even after retiring from Reinhardt, Dr. Jernigan’s support did not cease. He served as the co-chair of the Reinhardt Ministerial Golf Outing from 1996-1998, raising $10,000 to $30,000 for the fund during those years. Wilson said she feels being at Reinhardt brought great happiness to Dr. Jernigan and Linnie Lou – after he hung his hat up from fundraising duties, Dr. Jernigan could be seen playing in the annual ministerial golf outings, well into his 80s. And he and his wife always lent their financial support to the University earning a spot on the Honor Roll of Donors. Dr. Jernigan’s efforts and support for Reinhardt led to him receiving the John Wesley Ministerial Award in 1998. Additionally in the late 1990s, his name was forever emblazoned on campus as Jernigan Way, which runs behind the Burgess Administration Building. Dr. Jernigan was living in Penney Farms, Florida at the time of his death. His survivors include his three children, Dr. Peter Jernigan, Mark Jernigan and Linda Jernigan, as well as six grandchildren. He was predeceased by his lovely and dedicated wife, Linnie Lou, and his brother, Jim Jernigan, who served as Reinhardt’s coordinator of ministerial relations for about 20 years. Please keep the Jernigan family in your prayers.